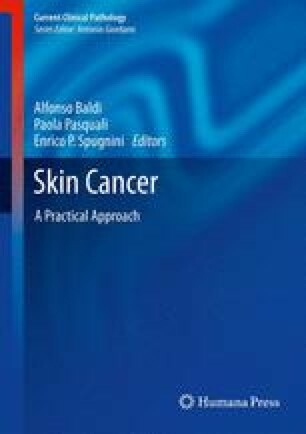 Skin adnexal neoplasms comprise a wide spectrum of more than 80 benign and malignant tumours, exhibiting morphological differentiation towards pilosebaceous unit, eccrine and apocrine glands. In addition more than one line of differentiation in this neoplasm could be observed. These tumours generally exhibit a benign behaviour, but malignant histotypes also exist. Clinical diagnosis of specific entity and of their potential malignancy is quite impossible. Thus, the diagnosis always requires surgical excision of skin lesion, and histological features at haematoxylin and eosin-stained sections are considered generally adequate for the correct classification of skin adnexal tumours. The use of histochemical and immunohistochemical stains could further aid in this purpose. Finally, they are usually encountered as single, sporadic tumours, but they may also occasionally be multiple and hereditary, heralding complex genetic syndromes that comprise visceral cancers.